I’ve just finished two books which are both rather special, with flashes of brilliance in each case. The first is Lou Anders‘ superhero anthology, Masked, and the second is volume one of the series that everyone is talking about, The Hunger Games by Suzanne Collins. Arguably the superhero genre was smashed apart and reassembled single-handedly by Alan Moore with his Watchmen series. After which the trend continued, with George R.R.Martin‘s Wildcards series showing what’s possible in textual narrative without the aid of graphics. 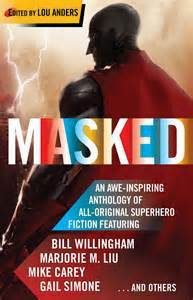 Anders has done the same with Masked, a sterling anthology, bringing together a series of stories by well known and less well known writers. Some, like Mike Baron and Mike Carey and Bill Willingham, already have a track record in the comics field. Others are stars of the science fiction firmament: Stephen Baxter, and Ian Macdonald, for example. The anthology contains tales of mythical heroes and heroines (Marjorie M. Lui’s Call Her Savage and Bill Willingham’s A to Z in the Ultimate Big Company Superhero Universe (Villains Too) (and I thought Harlan Ellison was the master of the world’s longest short story titles). What we have here, for the most part, is plausible, fallible, emotionally complex heroes and villains. You’ll find a gay (or is he?) English superhero, a lonely superhero wife (Head Cases by Peter David and Kathleen David) and a space age hero who can only operate in outer space (Stephen Baxter’s Vacuum Lad). I won’t go into the stories in any more detail, though I would like to single out one for special praise. While all of the stories were superb in every respect, one story leapt out at me and actually made me shed a tear. That story isGail Simone’s Thug. The story is about Alvin Becker, tall and strong, whose muscle power is put to use in the cause of villainy. Told in the form of his prison journal, his semi-literate writing style fully immerses you in his character and, in a short number of pages presents you with an all-too-human life rich in emotional complexity. Thug is a powerful work of literature also, and if there were any justice it would be put forward for any mainstream literary awards for shortform work. So please, go out and buy this book – and push it into the hands of any professors of literature you know and tell them to use Thug as a set text! And so to The Hunger Games. I’ve just started reading the second book in the second series, so I cannot yet comment on that. Yes, I realise it’s the new BIG THING, what with the film version and the rabid fan base. All that aside, this incredibly tense, vivid, future world adventure combines elements of science fiction and fantasy with social commentary and a political acuity that very much reflects on the world as we currently know it. As well as telling us of its inherent dangers for future generations. Heroine Katniss Everdeen is chosen as a “tribute” to take part in the high-stake games. Games that literally mean life or death. Her task is to kill every other participant in order to emerge victorious. The central idea isn’t new, of course. Logan’s Run, Death Race 2000, Battle Royale and, arguably, Lord of the Flies, tackled similar issues and ground, in the latter case better. But Collins’s novel is still unique unto itself. A very fine YA novel that works equally well for adults. Best YA I’ve read since Philip Pullman’s Dark Materials Trilogy.